Bet Texas A&M-Alabama over 61 with 888Sport. Bet Mississippi State -10 over Kentucky with 888Sport. Bet Tennessee +4.5 over Florida with 888Sport. Bet Georgia-Missouri under 64.5 with 888Sport. For the SEC’s new coaches, the first few weeks of the season have run the gamut. Joe Moorhead has Mississippi State unbeaten and not missing a step on offense. 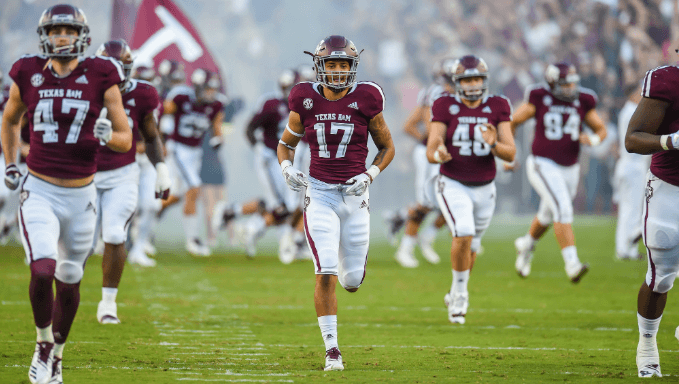 Jimbo Fisher is trying to turn Texas A&M quarterback Kellen Mond into the second coming of Johnny Manziel. Dan Mullen’s Florida squad lost to Kentucky for the first time since “Top Gun” was in theatres. At Tennessee, Jeremy Pruitt’s Volunteers remain an unknown. And at Arkansas? Let’s just hope Chad Morris decided to rent and not buy. And here’s the thing: For many of those new guys, it hasn’t even begun to get tough yet. For some, as the rugged SEC schedule progresses, it will get better. For others, it will get a lot worse. For all of them, this week presents early tests that may shape their debut seasons. Yes, the Tide last week proved a bad beat for over betters, putting up 49 in the first half and then coasting to a result that proved nine points shy of the over/under number. But unlike Ole Miss last week, Texas A&M shouldn’t get shut out. The Aggies, who put up 26 points on No. 3 Clemson two weeks ago, are averaging 596 yards and 44 points per game behind the resurgent Mond. Alabama, with the most dynamic offense of the Nick Saba era, is averaging 56 points a game. While that spread of Texas A&M +27 is tempting, that over/under number of 61 is irresistible. Bet the over with 888Sport. After ending its 31-year losing streak to Florida, are we believers in Kentucky? Maybe not yet. At the same time, we’re also not quite ready to anoint Mississippi State as a primary challenger to Alabama in the SEC West. The Bulldogs slaughtered the Wildcats last season in Starkville, and many of the same players from that game return on both sides. It’s easy to like quarterback Nick Fitzgerald in that Moorhead offense, not to mention the Bulldogs’ fantastic defensive line against Kentucky’s running game. For years, Kentucky has teased us with signs of a breakthrough, only to fade back into mediocrity. Here we go again. That’s why we’ll back Mississippi State and give the 10 points at 888Sport. And now, a rivalry built on the backs of Peyton Manning and Steve Spurrier, that this weekend could finish 6-3. Perhaps Mullen and quarterback Feleipe Franks found their footing last week against Colorado State, but 102,000 out for blood in Neyland Stadium make for a different environment. It’s hard to know what to make of Tennessee, which has eased past two lower-tier opponents, showing some offensive aptitude in the process. But nobody trusts that Florida offense, which looked slow and clumsy at home against Kentucky, and this one’s on the road. The last Florida coach to lose to Kentucky and Tennessee in the same season? Bob Woodruff in 1955. We like Tennessee +4.5 with 888Sport. Georgia scores tons of points. Missouri scores tons of points. They’re going to short-circuit the Faurot Field scoreboard, right? Well, perhaps. As South Carolina discovered, that Georgia defense is more than capable of shutting down even potent opposing offenses on the road. Mizzou needed a scramble last week to win at awful Purdue and has a history of crashing back to earth against elite opponents. Quarterback Drew Lock is the real deal and the Tigers have won nine of their last 10 games, but they won’t score at will this week. That’s why we like betting under 64.5 with 888Sport. Did we mention Ole Miss was shut out at Alabama? The Tide exploited the numerous weaknesses the Rebels present on defense and never gave the home team a chance. It should be different against the Golden Flashes, who offer a perfect opportunity for the Rebels to return to the high-scoring ways they showed in their first two games. Ole Miss’ points against Alabama: zero. Against two other lower-level opponents this season: an average of 61 per game. And the Rebels have plenty of frustration to take out against Kent State. Bet Ole Miss -28.5 with 888Sport. The Gamecocks has extended preparation time given their game last week against Marshall was cancelled due to Hurricane Florence, but Vanderbilt showed all kinds of poise by rallying to nearly knock off No. 8 Notre Dame in South Bend. We’ve been waiting for the Commodores to show us something besides bullying lower-tier foes, and that was it. Notre Dame’s offense isn’t as dynamic as South Carolina, and Vandy’s stadium is hardly intimidating. But the Commodores have simply looked better than the Gamecocks to this point, reason enough to go with the underdog at home. Take Vanderbilt +2.5 with 888Sport.